$7.03 /SF (Versailles Pattern - 160 SF Pallet) Contact us for pricing and quantity discounts. Local pickup and direct shipping anywhere in the USA. 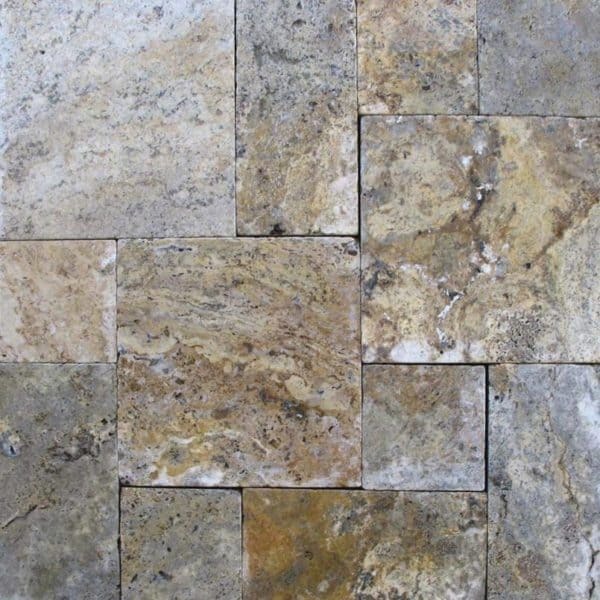 Tuscany Scabas pavers are one of the true representations of Mother Nature in terms of multi colors and wild variation. The color combination of yellow, beige, black and brown contrast and permeate the stone thus contrast of colors makes it very distinctive and attractive. It is available as a 1.25 inch thick paver and as 2 inch thick pool coping. Tuscany Scabas pavers are perfect for use around pools, on patios, walkways, and outdoor living spaces.